Website Solutions for Your Budget in Carlsbad, Ca! Having a strict budget isn't always a bad thing. Our affordable Website design packages move your business forward fast. MagnifyAds Custom Website Solutions are easy on your wallet without losing the professional “look & feel” that your business requires and that you expect. MagnifyAds does Custom Website Design in Carlsbad, Ca. Our solutions emanate from the recognition that in today's highly competitive online environment, it is especially prudent to design or redesign a site in a way that satisfies the criteria of the search engines, while also providing a compelling user experience and Optimized Website Design. Striking an Optimized Website Design balance is a unique task that many companies simply do not attempt. MagnifyAds has significant experience in this area, particularly in understanding what the search engines are rewarding design / functionality-wise and translating that into a compelling site and user experience. We have an ability to anticipate project challenges and maintain an effective line of communication with our clients that is well proven in our industry. 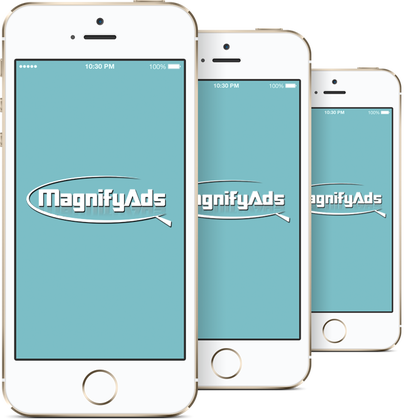 MagnifyAds Mobile Responsive websites are beautifully viewed on every possible mobile device. Our highly intuitive digital web solutions allow you and your customers to have a unique digital experience. We help you create a fantastic looking online presence, using advance technology, search engine friendly and mobile ready, to target your customer through social media , and SEO integration.